HODEIDA, YEMEN — “They told us that if we didn’t confess they would kill us and throw our bodies into the sea for the fish and birds to eat,” recalls Omar Ghalib, a Yemeni fisherman who was kidnapped by Saudi fighters and then tortured while out in his boat late one evening in Yemen’s port city of Hodeida. The fishermen all hung large white flags on the back of their boats signaling to the Saudi Coalition battleships that they are simply fishermen and mean no harm. Despite making their mark clear, Omar told MintPress that six soldiers on board a gunboat approached them and began opening fire on them before all 10 fishermen surrendered. But it didn’t seem to matter what Omar or the other fishermen had to say. The soldiers had made up their minds and were determined to terrorize the men. Despite the fact that Saudi soldiers found nothing on their boat, the fishermen were accused of being Houthi collaborators leading the Saudi forces to take the men to a prison torture room inside a Saudi battleship where they were stripped down naked. Two children, accompanying their fishermen fathers, were also present and taken prisoner as well. Ghalib’s horrific story is one that has been shared by many fishermen over the course of Yemen’s brutal war waged by Saudi Arabia and the United Arab Emirates, and funded in large part, if not entirely, by the United States against the Yemeni resistance group Ansar Allah after the latter took power in 2015. For the past three-and-a-half years, the Saudi/UAE coalition — with support from the United States and the United Kingdom — has relentlessly bombed civilian targets, including schools, hospitals, clinics, water-treatment facilities, and even school buses. But little attention has been given to the devastating reality fishermen, who have become frequent targets, have to live each day. And it’s no accident. This is part of the U.S.-Saudi led coalition’s long-standing efforts to wage war against Yemen’s food supply. In the first year of the war alone, the coalition bombed over 350 farms, factories, food storage sites, markets, and other agricultural infrastructure, resulting in heavy damage to Yemen’s small portion of arable land — a lifeline for its people. With neither farmers nor fishermen safe from coalition attacks, famine has become a massive crisis in Yemen, further exacerbated by the coalition’s blockade of the country since March 2015, when Saudi Arabia launched its war against Yemen. The blockade prevented food from being imported into the troubled nation. The gravity of the situation is starkly revealed by recent warnings from the UN, which has cautioned that an estimated 18.4 million Yemenis — two-thirds of the country’s entire population — now risk starving to death. 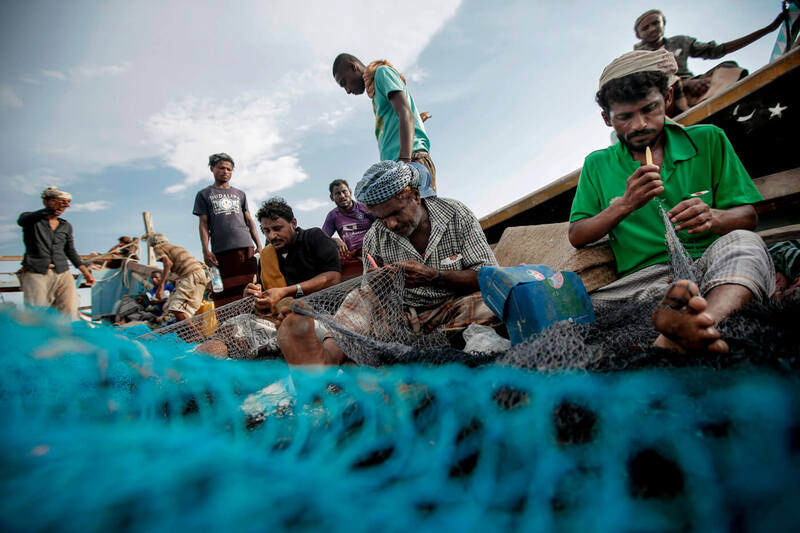 However, thanks to the coalition’s naval blockade of Yemen, Yemen’s fishermen are arguably in an even more precarious situation, as they are targeted by coalition fighter jets and naval vessels alike. As a result, since the war began, at least 200 fishing boats have been damaged or destroyed and over 334 fishermen are believed to have been killed by coalition ships and helicopters, according to statistics from Yemen’s Fisheries and Aquaculture Authority. This amounts to over $5.6 billion in total losses from Yemen’s Red Sea fishing sector. The 2.3 million people who live in Hodeida make it the second largest in population among Yemeni provinces.The U.S.-backed Saudi coalition against Yemen has drastically increased its attacks against Hodeida province since June of 2018 as part of its Operation Golden Victor to retake the port from Yemeni forces. Since Saudi Arabia’s Operation Golden Victor began, the number of displaced people from Hodeida has reached up to one million, who are escaping daily threats from airstrikes, Saudi-backed mercenaries, famine, and poverty. Despite this horrifying reality, these incidents haven’t stopped the remaining fishermen from the Al-Rabsa neighborhood, where Omar lives, from going back on their boats to seek sustenance and an honest living from the sea, as they have for generations. But Omar admits that he’s haunted by the horrifying memories of witnessing those closest to him die. I watched them all flocking to the house to visit me so my heart was naturally unsettled. I told them I can sense something, what’s wrong? Tell me! They told me that there was nothing wrong. But my heart was telling me that something was wrong, a mother’s heart can never lie. I see them… I see them anxious. I insisted that they tell me what’s going on but nobody said a word. I eventually held Omar and asked him, ‘What’s going on? Please tell me!’ He then said, ‘Mohammed was killed,’ so I said ‘How?’ He replied ‘An airstrike.’ I screamed and cried saying, ‘My son died! My son died!’ I passed out and it all went foggy in my mind before being rushed to the hospital. Four young men went missing including my son, my husband’s brother, and two other men who were about the same age as my sons. They searched for the bodies and only found them on the fifth day. My son’s body was so swollen, I couldn’t recognize him. This is how it is for many Yemeni mothers and families torn apart by the years of violence and death. Omar is the only one of the fishermen who was able to speak with MintPress, but as we tried to enter the al-Rabsa neighborhood to take more testimony from the other fishermen for this story, clashes intensified as Saudi planes continued to bombard the province. For the remaining residents of Hodeida, and perhaps the entire country of Yemen, it’s only a matter of time until their last remaining lifeline of food is stripped away — threatening to wipe out an entire nation at the hands of U.S.-backed, Saudi-led coalition. Is there not any country that will take this obvious example of war crimes to the appropriate courts? You know, it’s disgusting that the Government of Canada and its prancing prince, Justin Trudeau, are selling armoured, military fighting vehicles to these Saudi war mongers and torturers. The Canadian media, including Canada’s public broadcaster, the CBC, never report on any of these atrocities, so few Canadians are aware of them and fewer still are aware of Canada’s role in abetting them. It makes me sick to contemplate what our country has become, selling its soul for pieces of gold. Not while the Saudis are sitting on billions of gallons of oil and are protected by the U.S. government, which has threatened the World Court to keep out of its war mongering affairs. I feel the same way. Basically we are now equated to the US and in the world standing does not unfortunately bode well for us in the future . Karma will visit the Canadian response to atrocity to be sure. What a shame that we have such spineless so called leadership in our once benevolent peaceful response to juctice. This is vile wickedness…not a shred of morality or humanity does this (US) government have. How can we be checked? The rest of the world fears our military & economic power. Our government needs to be brought low by the unification of all other nations, who we lord over. The Troika of Terror: US, Saudi Arabia, Israel…Outlaws among nations.